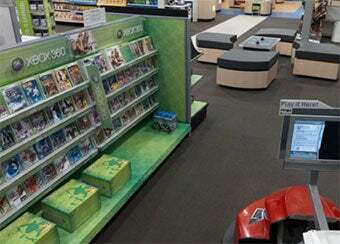 Microsoft are opening dedicated retail stores. Like Apple Stores, only for...Microsoft. And while early pictures of a "concept" store suggested as such, we've today received confirmation that they'll be selling Microsoft games and hardware. A Microsoft spokesperson has told MCV that the stores - which will be opened "in a few major cities around the world" - will be selling 360 games, 360 hardware and PC games. They'll also be selling all kinds of other stuff (like Windows, etc), but games are the gear you'll no doubt be most interested in.